Another spontaneous, candid shot of what looks like pretty miserable duty. No caption or date. 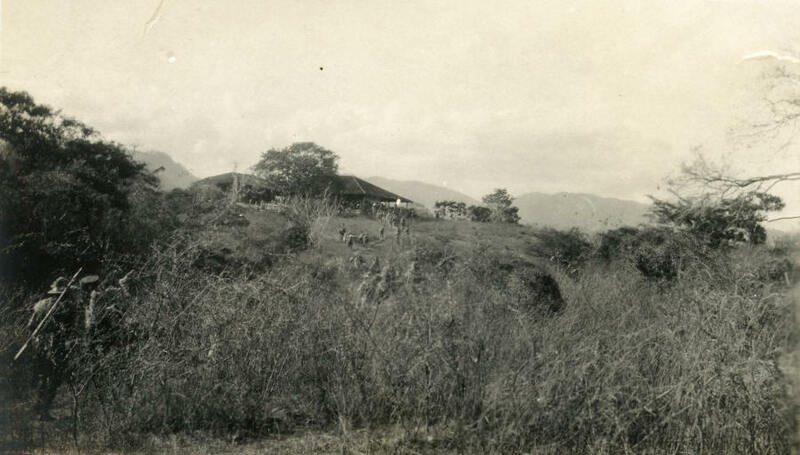 Patrol approaching a building atop a hill, somewhere near the Honduran border. No caption or date. Photo MCRC-4.3. Marines resting on a log along a trail. On break along a trail. Looks like lunch. No caption or date. Photo MCRC-4.4. 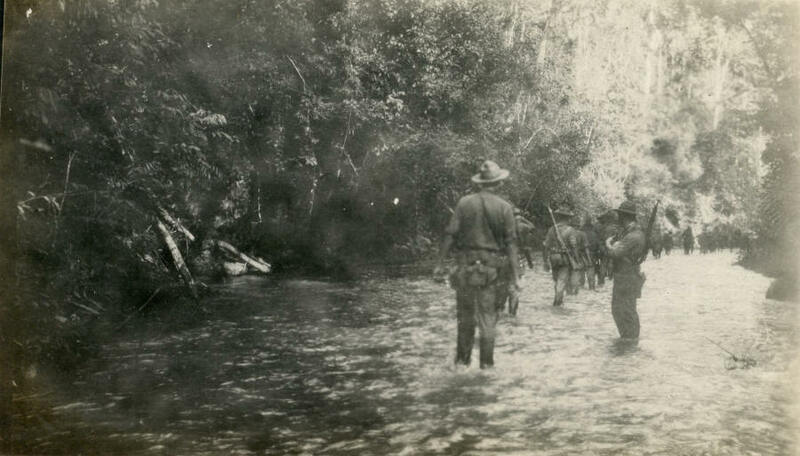 Patrol marching through open forest. Armed foot patrol of some 25 men, apparently a mix of Marines and Voluntarios being led by two mounted guides. No caption or date. 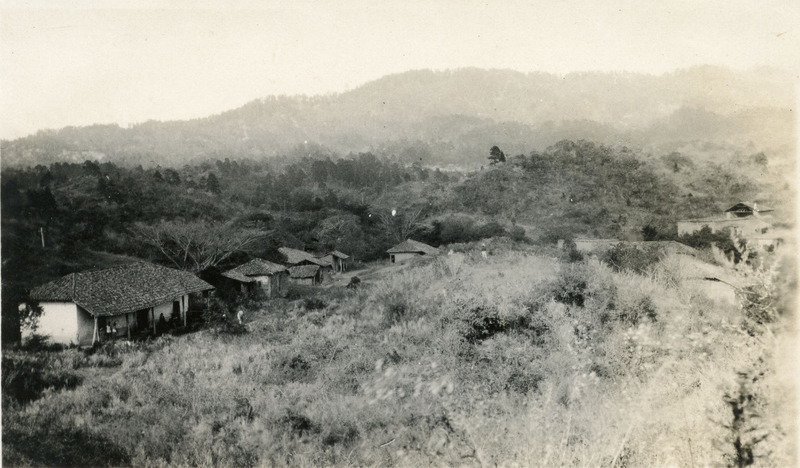 Cluster of houses nestled in a small valley, with natives visible under the roof of the house on the far left. No caption or date. 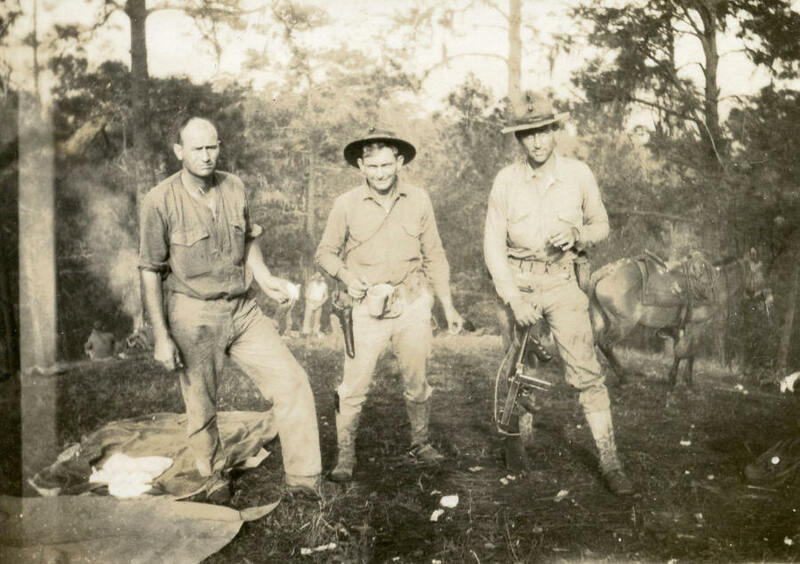 Three Marines in what looks like the morning after a night sleeping in the field, with the man at right cradling the muzzle of a Thompson sub-machine gun. No caption or date. Photo MCRC-4.7. 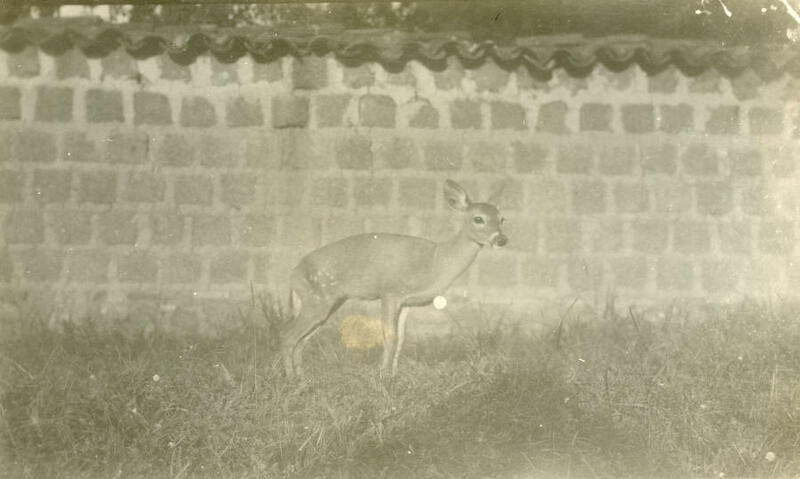 Betty the deer, mascot of 50th Company in Somoto. Caption: "'Betty' Mascot of 50th Company, Somoto, Nic. 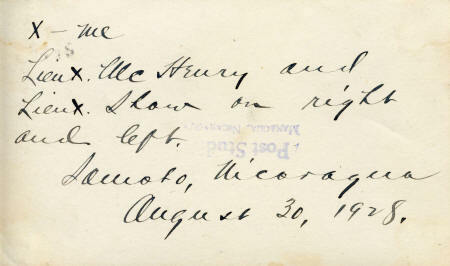 Aug. 15, 1928". Photo MCRC-4.8. 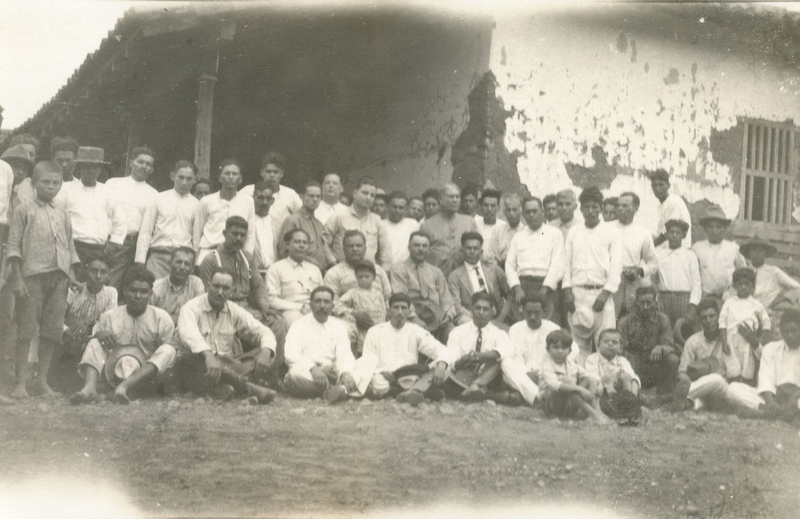 Gathering of citizens and Marines in Somoto. No caption or date. 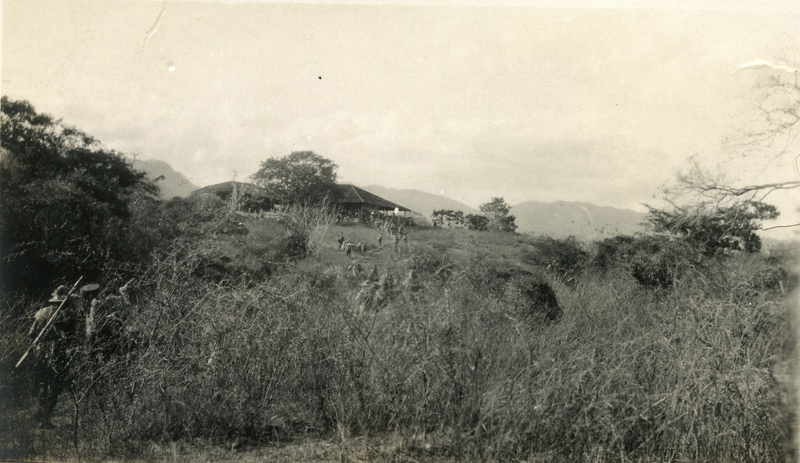 Appears to be a gathering of civilian men & boys in Somoto, with what looks like Capt. Stockes in the center. 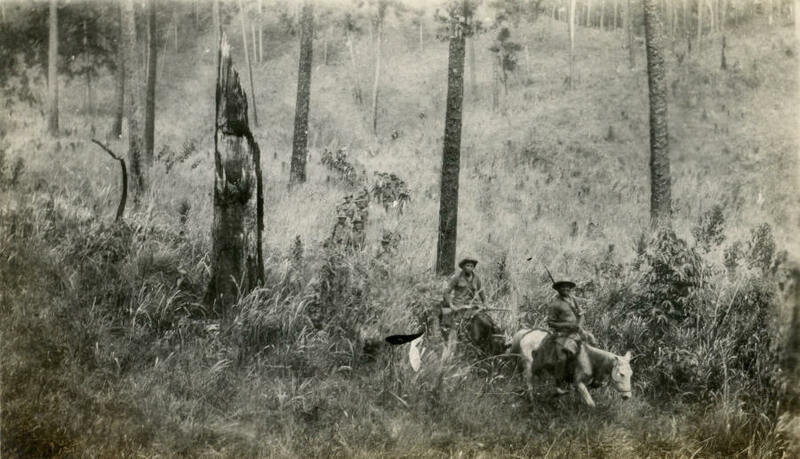 Image seems emblematic of Stockes' efforts to get to know and gain the trust of local inhabitants. Photo MCRC-4.9. 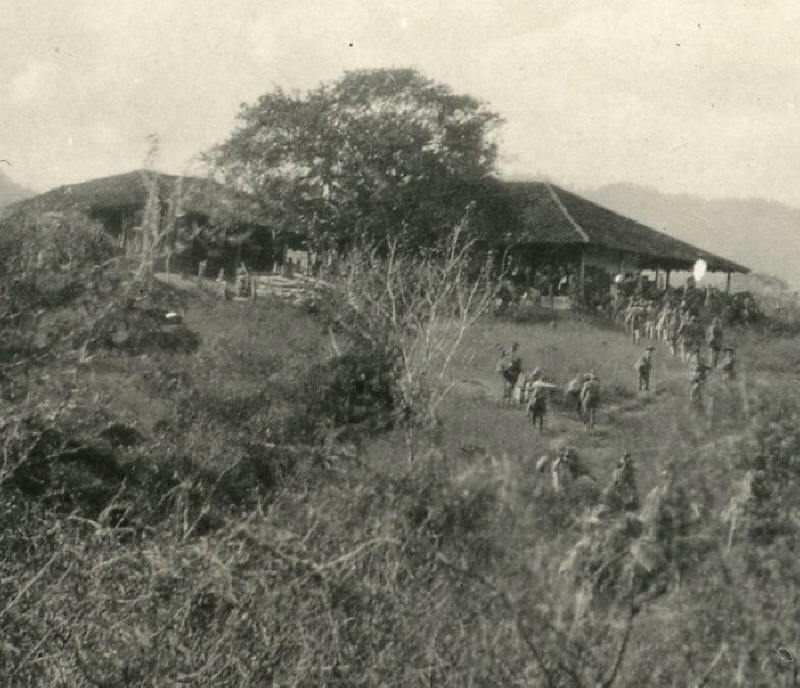 Marine barracks, Somoto, 1 October 1928. 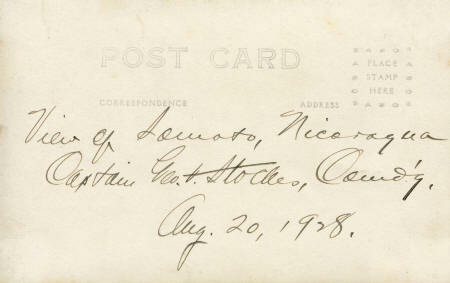 "Marine Barracks, Somoto, Nic. Capt. Geo. 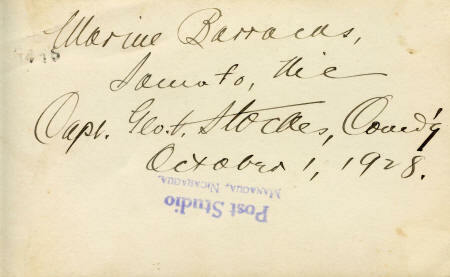 H. Stockes, Commd'g October 1, 1928". A brilliant photograph. Photo MCRC-4.10. 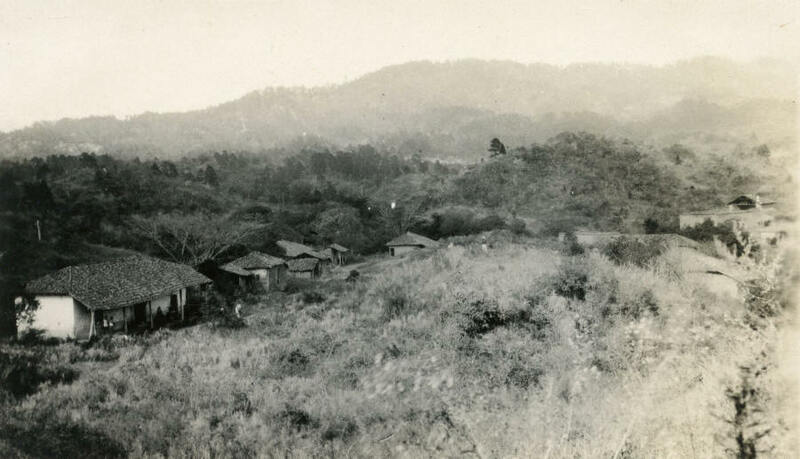 Panoramic view of Somoto Valley. "View of Somoto, Nicaragua. Captain Geo. 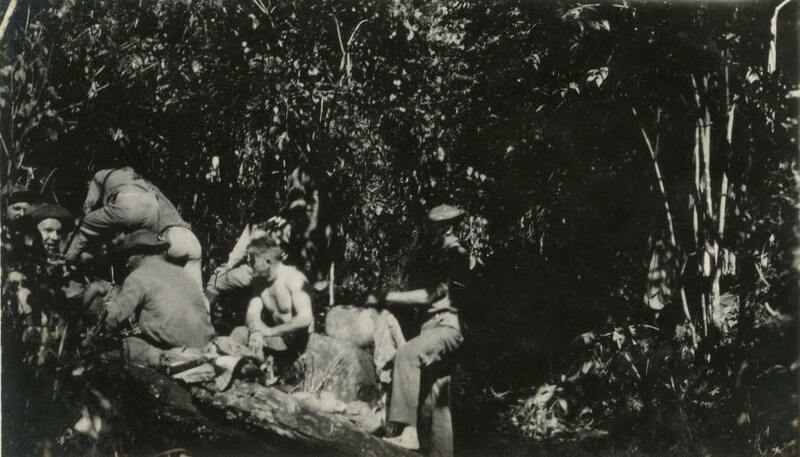 H. Stockes, Comd'g, Aug. 20, 1928". 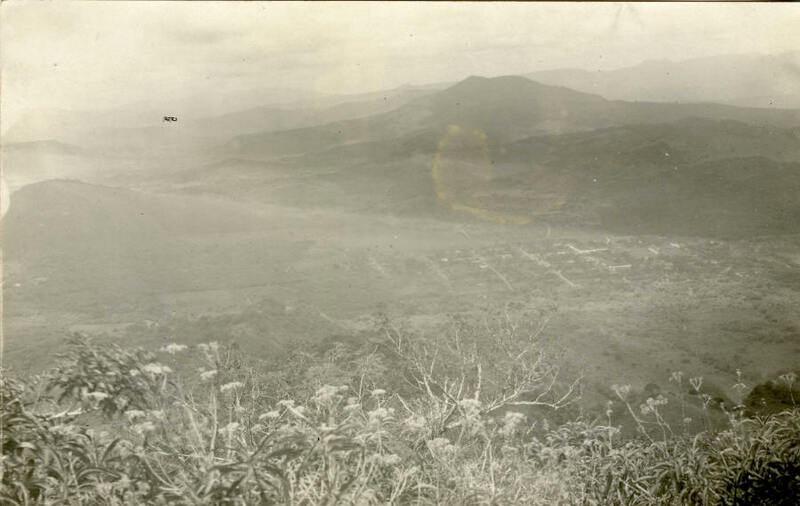 Another brilliant photograph, with the town of Somoto nestled in Somoto Valley, and Somoto Mountain looming in the background. Photo MCRC-4.11. Mounted patrol with Capt. Stockes and Lts. McHenry & Shaw, August 1928. "X - me. Lieut. McHenry and Lieut. Shaw on right and left. 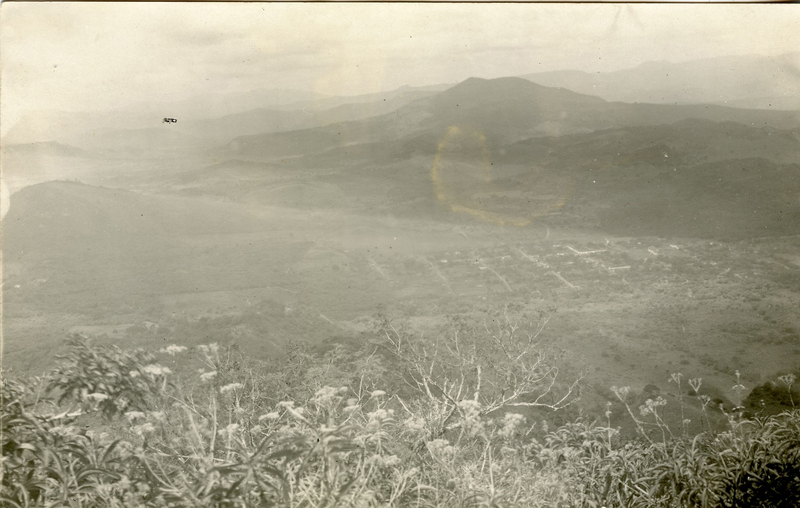 Somoto, Nicaragua, August 20, 1928." 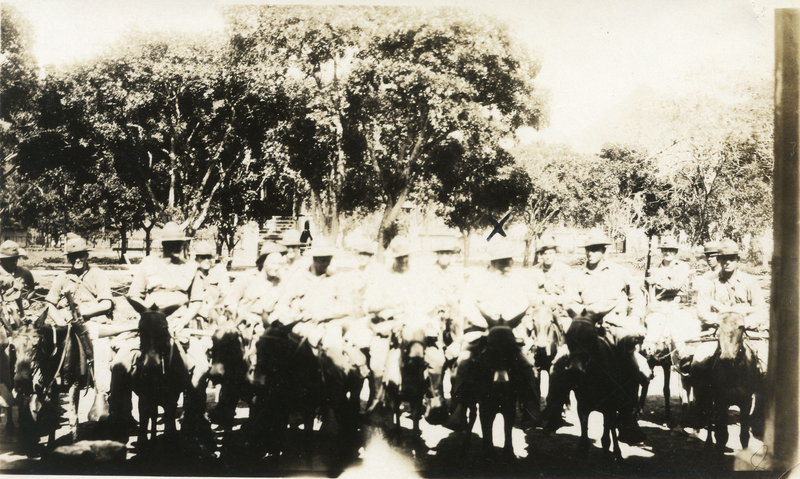 Marines posing on horseback next to the town square; another terrific photo despite being a bit overexposed in the center. Photo MCRC-4.12. 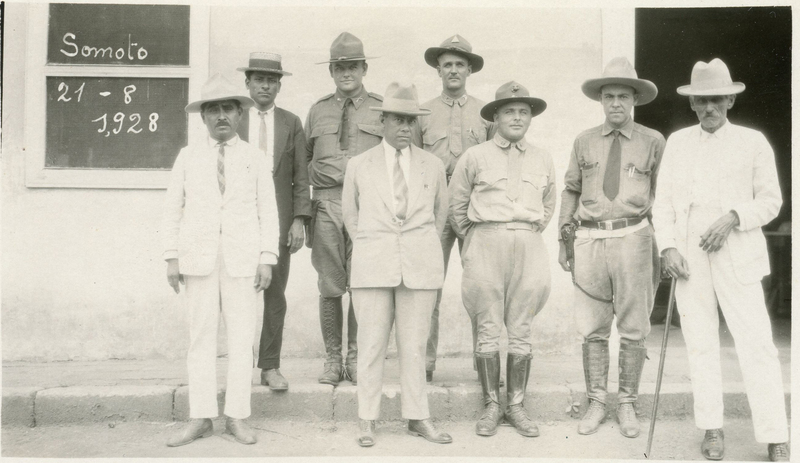 Eight Marine officers & one U.S. Army officer posing in Somoto, July 1928. "Front row - Capt. Stockes, Capt. Reagan, Lt. Mosher. Back row - Lieut. Brink, Lieut. Luckey, Capt. 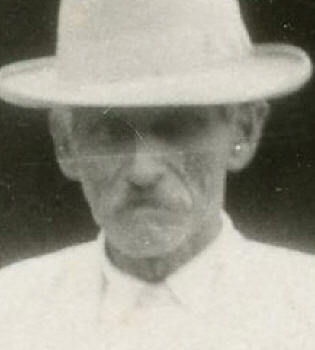 Erskine, Colonel Dunlap, Capt. 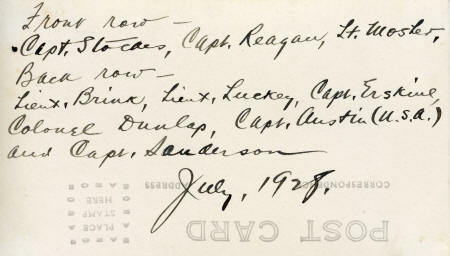 Austin (U.S.A.) and Capt. Sanderson. 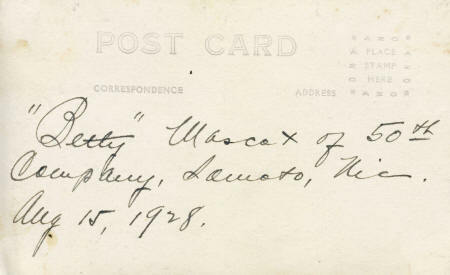 July, 1928." Presumably in Somoto. Photo MCRC-4.13. Three Marine officers, three civilians, one Voluntario jefe, in Somoto, 21 August 1928. 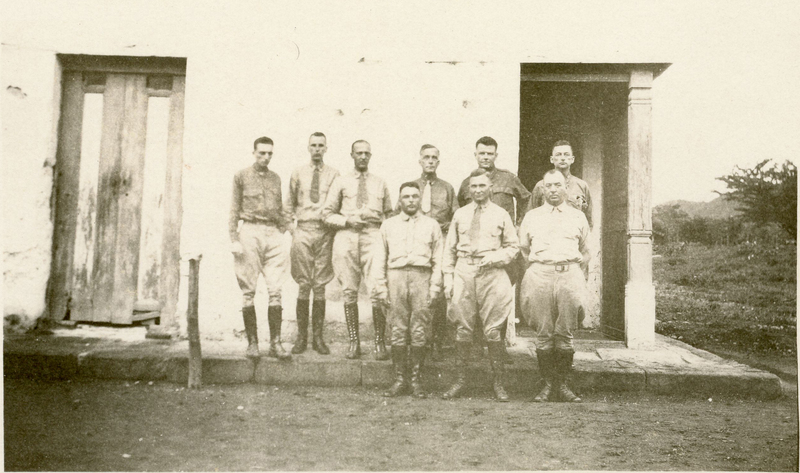 No caption for this photo of eight men taken in Somoto on 21 August 1928. 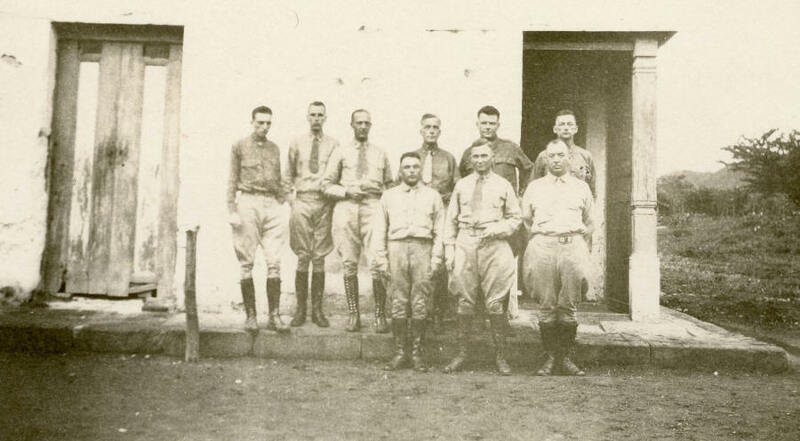 But comparing the faces here to the men in the photo above, we can identify at least the three US Marines: Captain George F. Stockes (front row, center) and Capt. 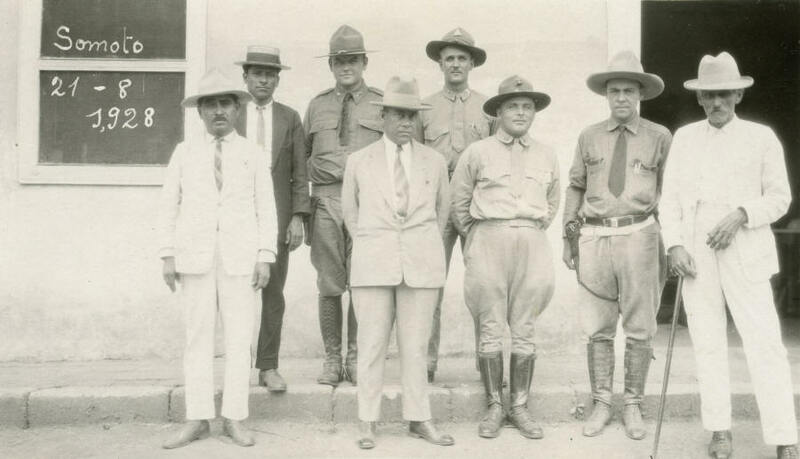 Graves Erskine (back row, right) and Capt. 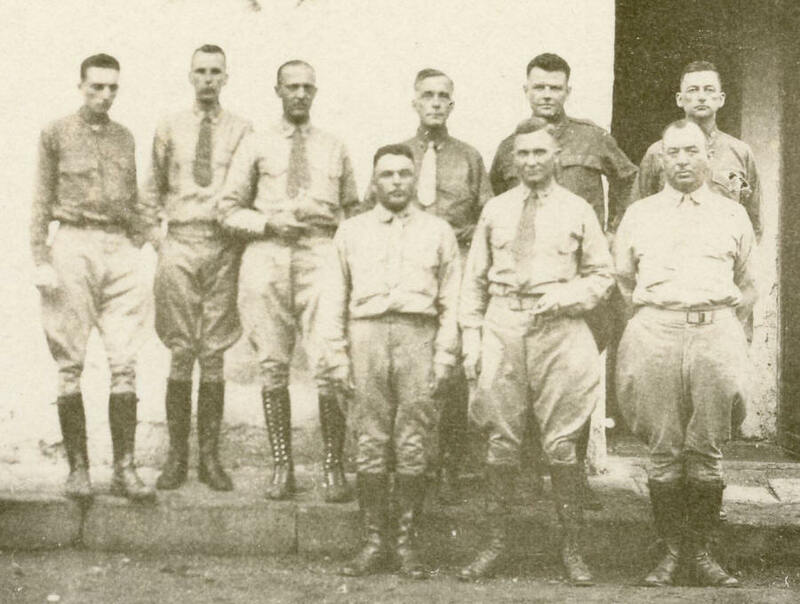 Austin (back row, center). The man in the front row, second from right looks like a Voluntario jefe, perhaps Augusto J. Caldera. Capt. Austin Capt. 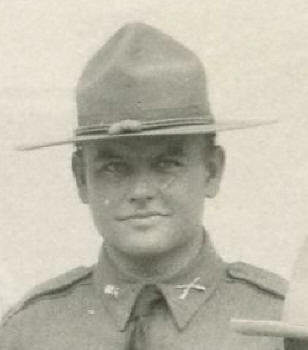 Graves Erskine Capt. 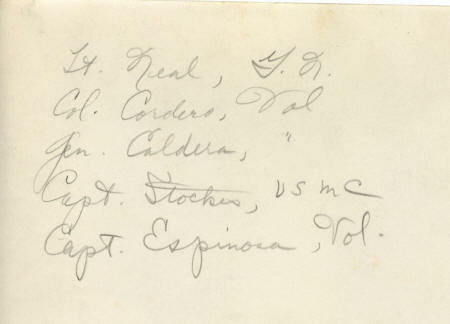 George F. Stockes Gen. Augusto J. Caldera? Photo MCRC-4.14. 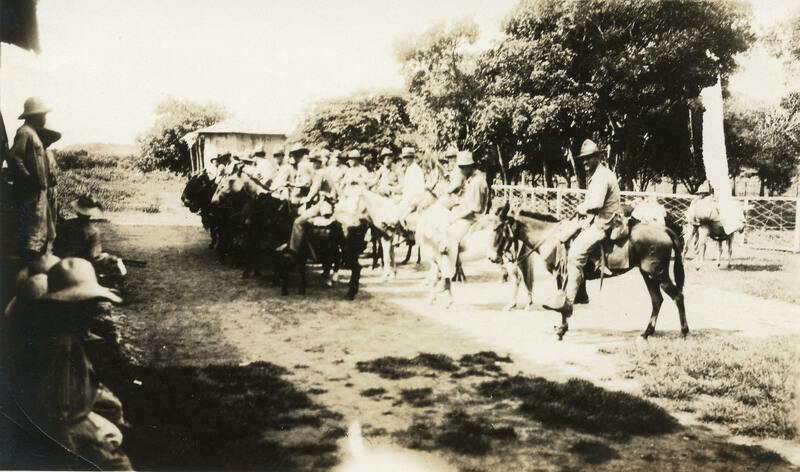 Mounted Voluntarios in formation. 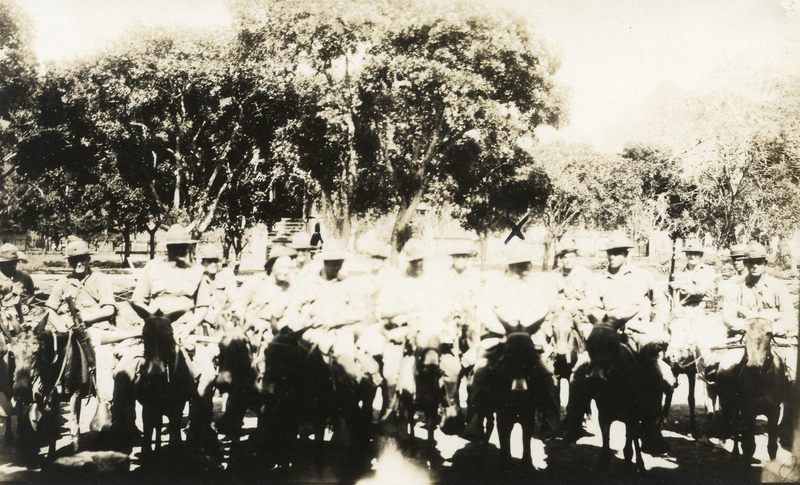 What appears to be a formation of mounted Voluntarios, perhaps in Somoto. No caption, no date. Photo MCRC-4.15. 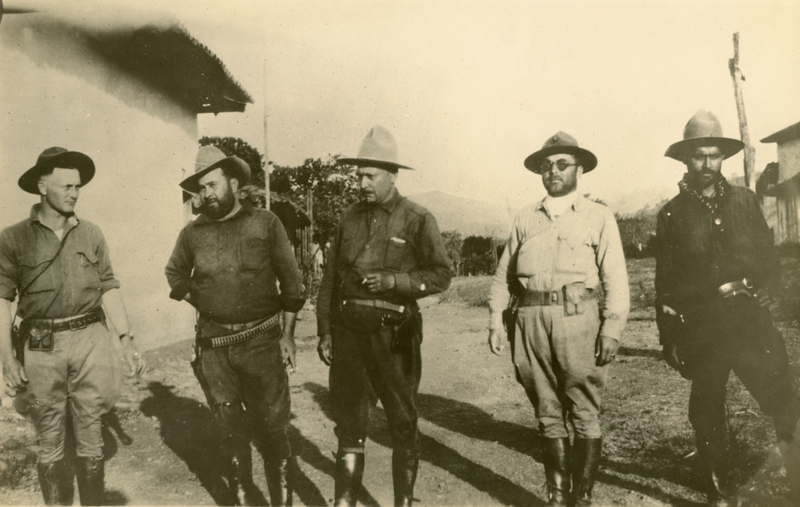 Lt. Neal (USMC), Col. Cordero (Vol. 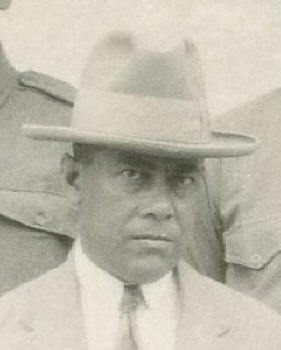 ), Gen. Caldera (Vol. ), Capt. Stockes (USMC) & Capt. 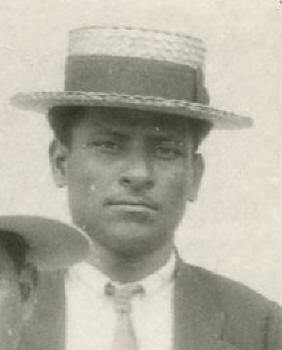 Espinosa (Vol). 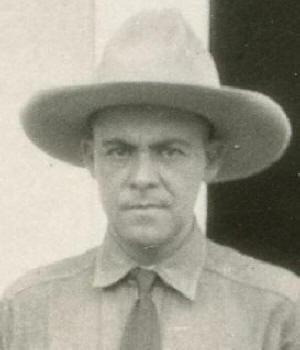 Caption on rear: "Lt. Neal, G.N. / Col. Cordero, Vol. / Gen. Caldera, Vol. / Capt. 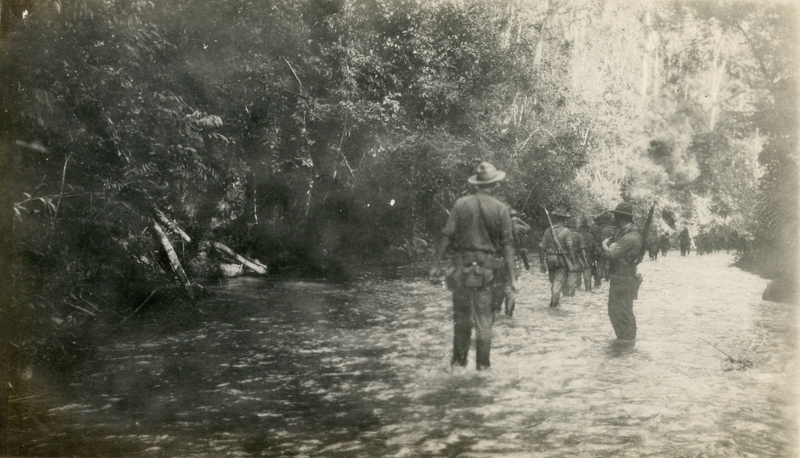 Stockes, USMC. / Capt. Espinosa, Vol." 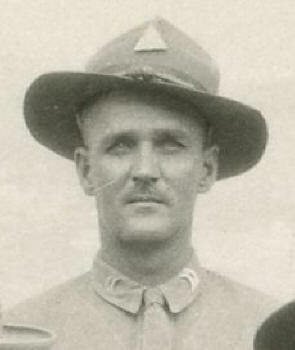 Lt. Neal, G.N. Col. Cordero, Vol. 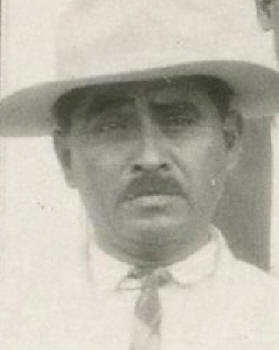 Gen. Caldera, Vol. Capt. 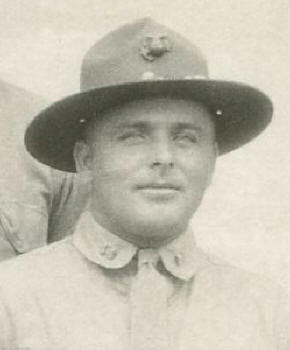 Stockes, USMC Capt. 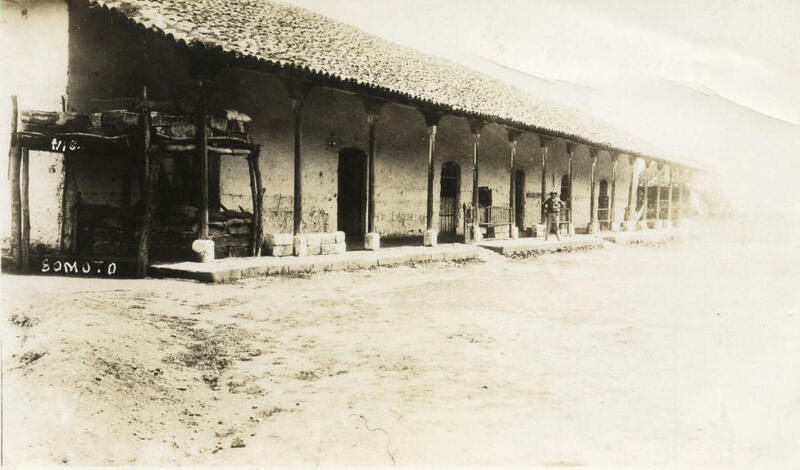 Espinosa, Vol.